So staying at this hotel could evoke an interesting story. Unfortunately the weather was a little bit cloudy in Bad Gastein so I spend some hours in my room N° 18 reading about Sigmund Freud and his theories. It was a small room with old fashioned furniture. Small but cosy. At the next morning I had a talk with the owner of the hotel. We spoke about the story of the building, about the chapel (!) inside and about important people who had already stayed here. Of course I asked him in which room Sigmund Freud did stay. ‘Actually it was your room, N° 18’ he answered. ‘What?’, I was stunned. I spent the night in Sigmund Freud’s room without knowing it? Immediately I rushed up to N° 18 again and took the pic above. It was not easy to shoot this photo as the bright light outside was a big contrast with the darkness of the room. Well, perhaps the best way to portray what Sigmund Freud felt while writing about Eros and Thanatos. 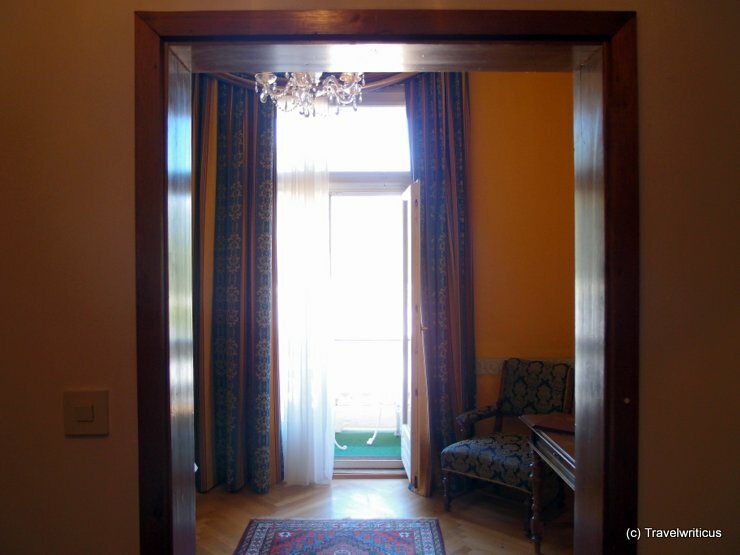 This entry was posted in Accommodations and tagged Austria, Bad Gastein, Pongau, Salzburg by Travelwriticus. Bookmark the permalink.